Police in Oak Bay have jokingly offered to take Mounties from the soon-to-be-defunct Surrey RCMP. Surrey's new council and mayor Doug McCallum passed a motion Monday night to replace the city's RCMP detachment with a municipal police force at a cost of about $120 million. While McCallum believes the switch to a police force can be completed within the next two years, Oak Bay police didn't waste any time reaching out to Mounties on Twitter. "Hey @SurreyRCMP members!" the detachment tweeted along with a link to a job posting and a fitting animated GIF from The Simpsons. 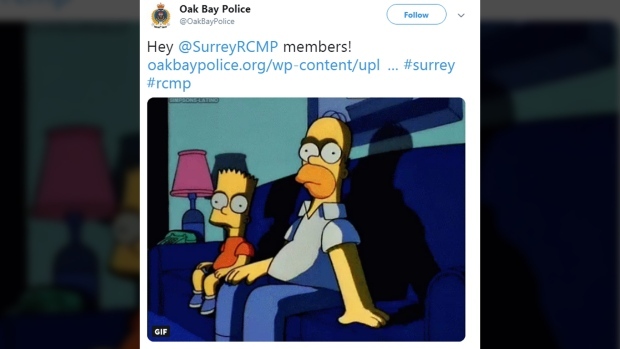 Surrey RCMP's Twitter account couldn't resist an equally funny reply, tweeting back "D'oh! @OakBayPolice too soon," with a clip of Homer Simpson sobbing. The exchange didn't stop there, though. The hilarious back-and-forth caught the attention of others online, with one commenting that whoever is running both force's Twitter accounts deserves a pay raise. The Oak Bay police job posting will remain up until Nov. 15. 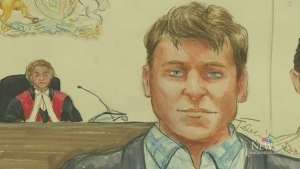 The detachment says it's looking for experienced officers from RCMP or municipal police forces around B.C.